Artwork Panel: 50.1cm x 96cm ≈ 19¾" x 37¾"
Silk/Brocade: 58.6cm x 152.3cm ≈ 23" x 60"
Width at Wooden Knobs: 67.6cm ≈ 26½"
The title of this artwork is 共飲一江水 (Gòng yǐn yī jiāng shuǐ). This title comes from a poem about two lovers living far apart. However, they drink from the same water source (a river). Therefore, whenever they miss each other, they just think about the river that connecting their love. Following the title, we can assume this is the woman from the pair of lovers, and some of the water drawn from the river is in the jug that she seems to delight in. 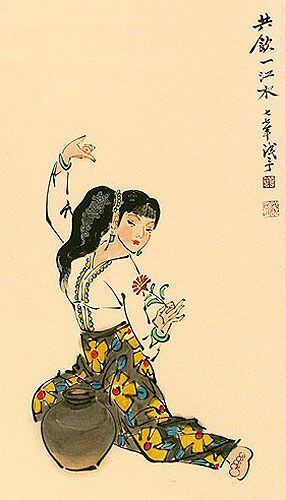 This was painted by Ye Qian-Yu. When I met him, he was retiring and had a lot of old artwork rolled up in tubes. I bought a lot of it, and some were treasures like this, and others were a little distressed. This was painted in 1977 (Yes, really 1977 as indicated in the Chinese characters below the title). The wall scroll is new, and the artwork is in perfect shape. This is a real classic.